What Does it Mean When Your Eyes Hurt? Let’s take a closer look at the three main causes. Pathology-related: Eye pain can arise from a variety of pathological causes, including an infection, inflammation or elevated eye pressure. Dry eye: Dry eye is a condition in which a person doesn’t have enough quality tears to lubricate and nourish the eye. (Source: American Optometric Association) A person either does not produce enough tears, or the tears are of poor quality. 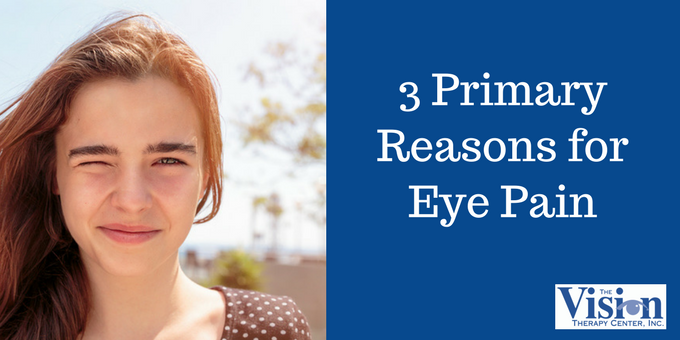 It may cause a person to experience irritated, gritty, scratchy or burning eyes. Undetected functional vision problem: Functional vision is how your entire visual system -- the eyes, the brain, the visual pathways -- work together to help you interact with your environment. Functional vision includes the following skill areas: Eye teaming, eye focusing, and eye movement. Functional vision problems that cause eye pain typically involve poor eye teaming and eye focusing. Now let’s answer a few of the typical questions patients ask us about eye pain. Why Does the Back of My Eyes Hurt, or Why Does it Hurt Behind My Eyes? If you experience eye pain that feels like it’s at the back of your eyes or behind your eyes, it could be the result of an undetected functional vision problem. Why does it occur? One reason may be that your eyes are working too hard to focus on a nearby object. Viewing a book or a computer, for example, requires the muscles in your focusing system to contract in order to bring the object into focus. If your focusing system doesn’t work efficiently, the extra effort required to bring the object into focus could result in the sensation of pain, which can be in or behind your eyes and even on your forehead. Why Do Your Eyes Hurt When You are Tired? 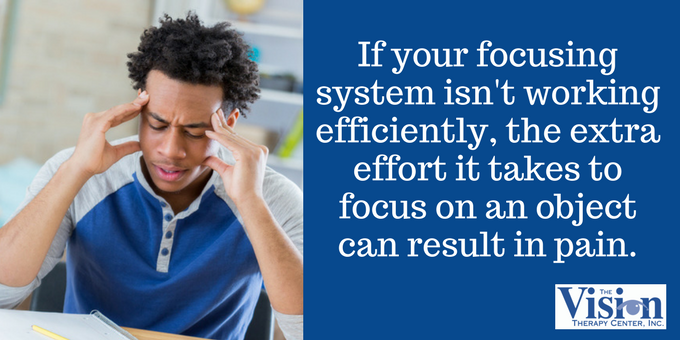 Continuing with the above example, when you are physically fatigued your focusing system may not work as efficiently as when you are well rested, which could lead to pain. Why Do My Eyes Hurt When I Wear Glasses? Your eyes really shouldn’t hurt when you wear glasses. If they do, visit your optometrist to determine if you have the correct prescription. Why Does Light - Such as Sunlight or Fluorescent Light - Hurt My Eyes? Sensitivity to light can result in anything from a stabbing pain to mild discomfort that leads you to reach for a pair of sunglasses. If you are having problems with fluorescent light, it may be simply that you need better lighting. We use full spectrum lights, and recommend it for office or school setting. You always want to make sure the light source is not directly visible to the eye. The use of lamp shades, for example, helps diffuse the light. We’ve provided you with an overview of what can cause a person’s eye or eyes to hurt. Now let’s review what you can do to correct the issue. 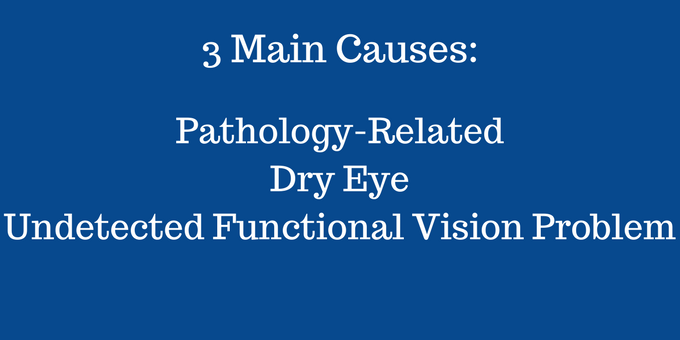 In cases of dry eye or eye pathology, you’ll want to see a primary care optometrist. A developmental optometrist has received extensive training and uses specialized equipment and exam techniques to detect functional vision problems. Treatment for a functional vision problem may include a glasses prescription and/or vision therapy. Moderate to severe pain and/or redness and/or swelling in or on one or both eyes. Eyes burning and/or scratchy. Eyes water excessively. Sensation that something is in your eye. Eyes hurt after focusing on tasks such as reading, computer work, and driving. Headaches can also occur, along with sensation of pain behind the eyes. Sensitivity to light may accompany these symptoms. 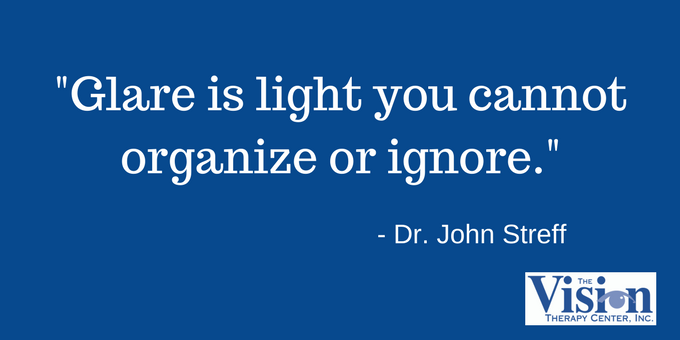 The American Optometric Association can help you find a general optometrist. The College of Optometrists in Vision Development can help you find a developmental optometrist. With a developmental optometrist, a Functional Vision Test will be performed on you or your child. This testing is far more comprehensive than typical vision screenings found at schools and in pediatricians’ offices, and is designed specifically for the vision problems mentioned earlier. Eye pain of any type shouldn’t be ignored. If you’re experiencing eye pain, take steps immediately to see an optometrist. And to see if you may be suffering from a functional vision problem, take our Vision Quiz.